Baby Sock Roses to write home about! The bouquet of baby sock roses you see below is AMAZING! Not only is the bouquet beautiful, but all the decor is absolutely perfect! The colors, to the layout, to the textures. Now here is an example of one of our readers following some simple directions of how to make a rose bouquet of baby socks, added some flair and personality, and created something far more elegant than the original instructions. Melissa from Texas submitted this adorable baby sock bouquet. Melissa has forever shared with us her creativity and artistic ideas with her baby shower decor and baby sock bouquet pictures. 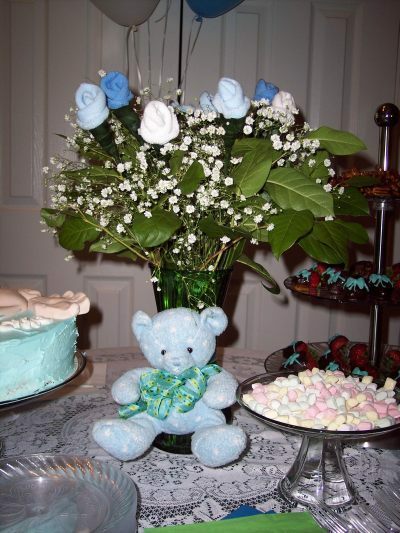 Melissa is a real-life example of how pretty you can make a baby shower by doing things yourself. 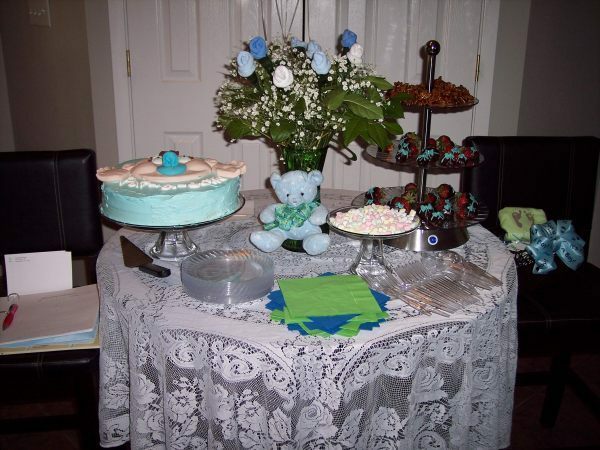 Melissa, thanks for sharing your picture-perfect baby shower ideas! Thank you so much for the detailed instructions on making the baby sock roses :-). It was a big hit at the party! Here are a couple of pictures. If this isn't in html format, I would be happy to e-mail them to you. Melissa, I can't tell you enough how beautiful your bouquet and decor really are! Thank you for sharing it with us! !